striving to provide the best possible care. Sally Jorden is a Macmillan breast care nurse at Southend General Hospital in Essex. After completing her nurse training in the 1960, she worked as a midwife, health visitor, staff nurse, night sister and ward sister. Now aged 74, she has been a nurse for 57 years, and set up the first breast care nurse service for Macmillan at Basildon hospital in 1994. Providing information and emotional support to patients diagnosed with breast cancer, and their relatives and carers, and helping people cope with the financial impact of cancer. I also attend breast screening sessions and act as ongoing support for those who think they may have breast cancer. 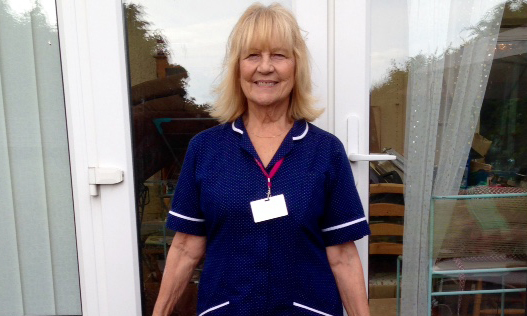 I planned to retire in 2014 but was asked to join the team to help cover long-term sick leave. I stepped into the role and hit the ground running. Mostly women, and some men, who will either be diagnosed with breast cancer or think they will be. Most have been referred by their GP. I love being part of a team who support newly diagnosed patients and help them come to terms with their breast cancer diagnosis, providing financial help as well as practical and emotional support. Being present when bad news is given, especially if someone has come for their results on their own, and seeing how people are financially affected because of cancer. To be an advocate for my patients by helping them with their concerns, and working with my colleagues to provide the best possible breast care service. Setting up the first Macmillan nurse-led breast care service at Basildon hospital. It was an exciting venture and has become a first-class unit, going from strength to strength. Choose a nursing pathway that inspires you and follow it with enthusiasm and energy. Do not let anyone dissuade you from your goals.